This week in Marvel Comics updates featured more on Secret Wars…that very present event in Marvel history. Previews include a look at if Spider-Man and Mary Jane remained married. Others look at much more alternative worlds that have zombies and monsters and Mrs. Deadpool!? But before that is about one of my favorite things to come out of the House of Marvel: Star Wars and Darth Vader comics. Director’s cuts are coming, and we have info on them. Further news include reprints of Squirrel Girl, who I hope never is in a Marvel movie because that will be a very short one, and schedule for Marvel’s presence at Atlantic City’s comic-con. Announcing the STAR WARS #1 & DARTH VADER #1 Director’s Cuts! New York, NY—May 12th, 2015 — Two of the biggest comics of the year are about to get bigger! Today, Marvel is proud to announce that the chart-topping, critically adored first issues of Star Wars and Darth Vader will return to comic shops this June for the STAR WARS #1 DIRECTOR’S CUT and DARTH VADER #1 DIRECTOR’S CUT! Experience the monumental return of the iconic Star Wars franchise to the House of Ideas with the first issues of these two blockbuster ongoing series! Taking place immediately after the events of Star Wars: A New Hope, these two explosive comics follow new adventures of beloved characters from the original trilogy! Created in close partnership with Lucasfilm, these new Star Wars titles exist as part of the canon for the Star Wars universe! Each director’s cut version features the entire first issue – read STAR WARS #1 or DARTH VADER #1 again or for the very first time! Then, go behind the scenes as you experience the making of these two landmark debuts. See script pages and in-progress artwork from each issue as the Star Wars universe is brought to life as only Marvel could! Marvel’s burgeoning Star Wars line has already taken the industry by storm, topping charts, returning for multiple printings and embraced by fans and critics alike. The world of Star Wars has made its historic return to Marvel, and no fan can afford to miss out on both these blockbuster ongoing series. Don’t miss the STAR WARS #1 DIRECTOR’S CUT and DARTH VADER #1 DIRECTOR’S CUT – coming to comic shops this June! New York, NY—May 11th, 2015— Father. Husband. Hero. The Amazing Spider-Man isn’t safe from the Secret Wars – and neither are you! Today, Marvel is pleased to present your first look at AMAZING SPIDER-MAN: RENEW YOUR VOWS #1, from blockbuster creators Dan Slott and Adam Kubert! Trust us, you have to read this to believe it! Prepare for the next evolutionary step in Peter Parker’s life as the Parker family faces Battleworld…together. Peter, Mary Jane and their daughter may not have much, but they have each other. Even as his city is torn asunder by a mysterious new villain, the safety of Peter’s wife and daughter comes first. But who is this mysterious “Regent” who has claimed the lives of so many heroes? How long till Spider-Man and his family are in his crosshairs? This is the story you’ve been waiting for. No fan can afford to miss the seismic AMAZING SPIDER-MAN: RENEW YOUR VOWS #1 when it explodes into comic shops this June! New York, NY—May 13th, 2015— Start your engines! Prepare for terror! The deadliest racers on Battleworld are peeling out and unleashing their fury this June. Today, Marvel is pleased to present your new look at GHOST RACERS #1 – a new Secret Wars series from writer Felipe Smith and artist Juan Gedeon! Put the pedal to the metal as the Spirits of Vengeance go head to head in lethal, cutthroat races! Welcome to the scorching hot track of Battleworld’s arena – for the one and only spectacle known as the Ghost Races! Enslaved and bound to the arena, cursed souls race at the speed of sin – and anything and everything goes! Friendship, loyalties and family bonds will be tested. All in the name of the top prize – temporary freedom from the arena! But what happens to the unlucky and unholy losers? Now, Robbie Reyes, Johnny Blaze, Danny Ketch, Alejandra Blaze and many, many more step onto the track for all-out, high-speed warfare. The stakes have never been higher as the most vicious Spirits of Vengeance do battle for their very souls! Who will come out on top and who will be left in the dust? Buckle up for the most wild ride of the Secret Wars when GHOST RACERS #1 speeds into comic shops this June! FIGHT! Your First Look at the SECRET WARS BATTLE STANDEES! New Promo Item Coming to Comic Shops This June! New York, NY—May, 13th 2015 — The Earth-shattering release of SECRET WARS #1 has already taken the comic industry by storm, but the story is just heating up! The destruction of the Marvel Universe was just the beginning! Today, Marvel is proud to present your first look at the SECRET WARS BATTLE STANDEES – an exciting new promo item coming to stores this June! Releasing alongside June’s SECRET WARS #4, the SECRET WARS BATTLE STANDEE ONE-SHEET features eight different characters that can be assembled into individual figure standees. Featuring artwork by rising star John Tyler Christopher, each sheet includes standees of Mr. 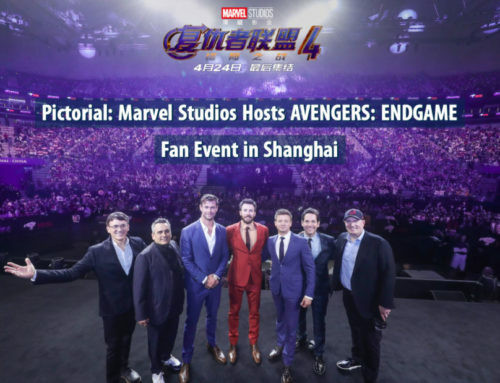 Fantastic, Black Panther, Miles Morales, Peter Parker, Star-Lord, Captain Marvel, Thor and Cyclops! Plus, don’t miss July’s epic SECRET WARS LANDSCAPE WRAPAROUND VARIANTS, the perfect backdrop for your Secret Wars Battle Standees. Featuring environments from across Battleworld, these five wraparound variants take fans from the Hulk overrun Greenland of Planet Hulk to the robot and zombie infested wastes of Age of Ultron vs. Marvel Zombies – and more domains in between! Pair them with your Battle Standees to create your own scenarios from the blockbuster Secret Wars! The fuse is lit. The Secret Wars are set to explode. Now is your chance to create action of your very own with the SECRET WARS BATTLE STANDEES and SECRET WARS LANDSCAPE WRAPAROUND VARIANTS! Retailers: Check your Marvel Mailer for more information on how to order the Secret Wars Battle Standees and Secret Wars Landscape Wraparound Variants. New Look at MARVEL ZOMBIES #1! New York, NY—May 13th, 2015— This June, a lone soldier ventures deep into unknown territory on a mission of personal discovery – and blood soaked survival! Today, Marvel is pleased to present your first look at MARVEL ZOMBIES #1 – a brand-new Secret Wars series from writer Simon Spurrier (X-Force, X-Men: Legacy) and artist Kev Walker (New Avengers, Avengers Arena)! She is Elsa Bloodstone, one of the fiercest monster-hunters Battleworld has ever seen. Burdened with the zombie hordes to the south of Battleworld, she patrols the borders from high atop the Shield. Day in and day out she fights and claws to keep the world safe, knowing that setting one foot into that hellish waste means certain death. That is, until she spots a human child alive among the corpses – and flings herself in. But now that she’s in – she’ll have to fight her way out! Can one woman stand against an endless army of the living dead? You’ve never met Elsa Bloodstone! Be there when the zombie-blasting, high octane action kicks off this June in MARVEL ZOMBIES #1! New York, NY—May 13th, 2015— This June – prepare to meet the strangest super team of them all as they emerge from Monster Metropolis and take Battleworld head on! Today, Marvel is pleased to present your first look at MRS. DEADPOOL AND THE HOWLING COMMANDOS #1 – a new Secret Wars series! From blockbuster Deadpool writer Gerry Duggan and artist Salvador Espin comes an explosive new adventure as Deadpool’s betrothed and a monstrous legion venture across Battleworld and beyond! Monster Metropolis – an underground city buried deep below Manhattan. Brimming with monsters, creeps and spooks – the city is home to any and all things that go bump in the night. It’s ruler – Shiklah, undisputed Queen of the Monsters! In her world, she ruled over all monsters with her husband Deadpool, the Merc With a Mouth. But on Battleworld, nothing is as it once was. With her husband now deceased and her city now residing beneath an entirely new planet, Shiklah now leads a super team unlike any you’ve ever seen before! The WARZONES! Get Weird in Your New Look at WEIRDWORLD #1! New York, NY—May 15th, 2015— This June, the most dangerous corner of Battleworld is born in WEIRDWORLD #1 – a brand new entry in the Secret Wars! Today, Marvel is pleased to present your new look at the exciting first issue from blockbuster writer Jason Aaron (Star Wars, Thor) and critically acclaimed artist Mike Del Mundo (All-New X-Men, Elektra). Venture deep into the strangest domain of them all as a lone warrior embarks on a savage quest. It is a world of swords, sorcery and all things bizarre. A land of gods and monster. Where perverted science and arcane magic run rampant. It is Weirdworld, the land where lost things go. Among its twisted and crazed landscapes walks Arkon, the barbarian king. With a sword in one hand and a battle bolt in the other, he ventures through Weirdworld in a desperate attempt to get back home. Yet each bend in the road brings new horrors, new monsters, new awful ways to meet your end. If Arkon is to find his way back to his homeland, he must first survive the Secret Wars! But can he? A lost man in a lost world, Arkon’s quest begins this June in WEIRDWORLD #1! New York, NY—May 15th, 2015— Is she tough? Listen bud: she’s got partially squirrel blood. And she’s also got new printings coming to comic shops this June! That’s right, the first four issues of THE UNBEATABLE SQUIRREL GIRL are coming back to the shelves, sporting four new connecting covers featuring art by Erica Henderson and new “alt. text” by writer Ryan North! Together the covers spell out Squirrel Girl’s catchphrase: EATS NUTS, KICKS BUTTS! Marvel Comes to Atlantic City This Weekend for ACBC 2015! Prepare yourselves, True Believers! This weekend, Marvel is coming to Atlantic City for the first ever Atlantic City Boardwalk Con! To kick off ACBC’s blockbuster first year, Marvel is bringing big name creators, jam packed panels, and can’t miss announcements! Head to one of Marvel’s fan-favorite panels for all the news fans crave about Secret Wars and so much more! Don’t forget to bring a camera! Then, swing by the Marvel Booth (Booth #1015) for events, signings, contests, giveaways and more! Marvel is taking Atlantic City by storm, and the Marvel Booth is the place to be to get in on all the excitement! 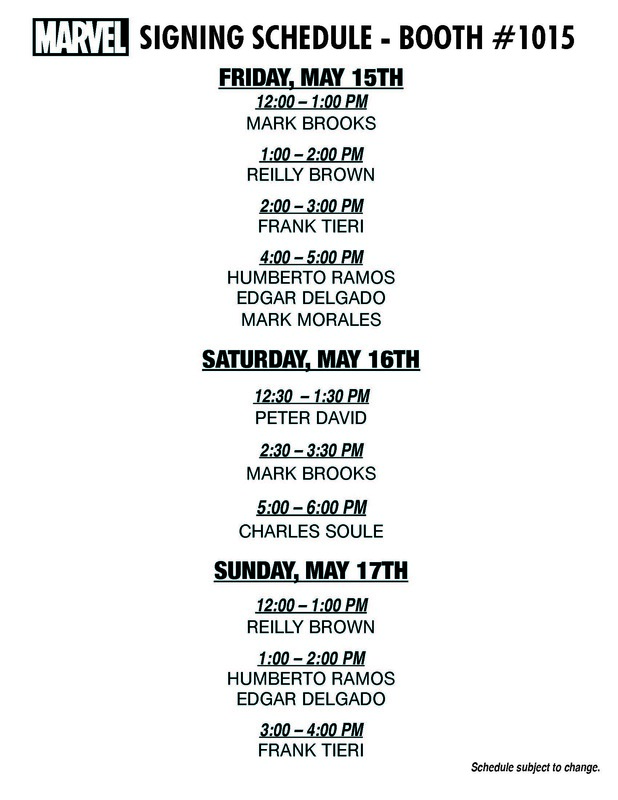 Featuring scheduled appearances by Charles Soule, Peter David, Humberto Ramos and more – it’s sure to be a convention to remember! Please note, all guests, times and rooms are subject to change. Giveaways available while supplies last. Are you a writer or artist? 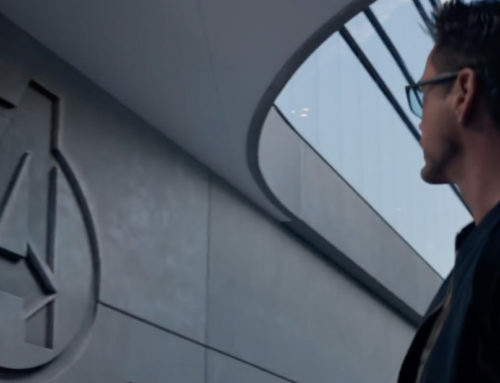 Ever dream of working for Marvel? Do you find yourself thinking, “I could do that…if I knew how!” Well, here’s your chance! Join Marvel Manager of Talent Relations Rickey Purdin, Editor Katie Kubert, Sales Communication & Event Coordinator Jake Friedfeld and a host of Marvel talent to find out the answers on how to get your foot in the door and make your job MARVEL! Join superstar artists Mark Brooks (Ant-Man), Humberto Ramos (Amazing Spider-Man), Mark Morales (Avengers & X-Men: AXIS), and Edgar Delgado (Amazing Spider-Man) as they are joined by other Marvel guests to discuss the ins and outs of being a successful comic book artist. Have any questions about what goes into putting together a comic book? Here’s your chance to ask the experts! We told you that “Everything Ends” in Secret Wars. So now the question is: What comes next? Join Content Development Director Sana Amanat, Manager of Talent Relations Rickey Purdin, and Editor Katie Kubert, plus writers Peter David (Secret Wars 2099) and Charles Soule (Inhumans: Attilan Rising) to get the 4-1-1 on Secret Wars and the future of Marvel! From Ms. Marvel to A-Force, from Twitter to Tumblr, women in comics has been one of the most talked-about topics in comics recently. Join the conversation as women from multiple disciplines in the creative process at Marvel discuss what it’s like working as a woman in comics today and what it means for the future of the industry! PLUS – A surprise announcement or two! Panelists include Content Development Director Sana Amanat, Editor Katie Kubert, and Producer Judy Stephens! 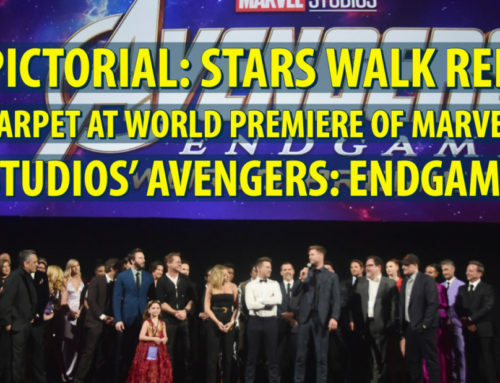 Join Executive Editorial Director of Digital Ryan Penagos, Content Development Director Sana Amanat, and Editor Katie Kubert for a private panel discussion of what’s happening inside the Marvel Universe. Get FREE merchandise, sneak peeks of upcoming comics, Q&A Session to answer all your burning questions and more surprises to be announced. Not to be missed! 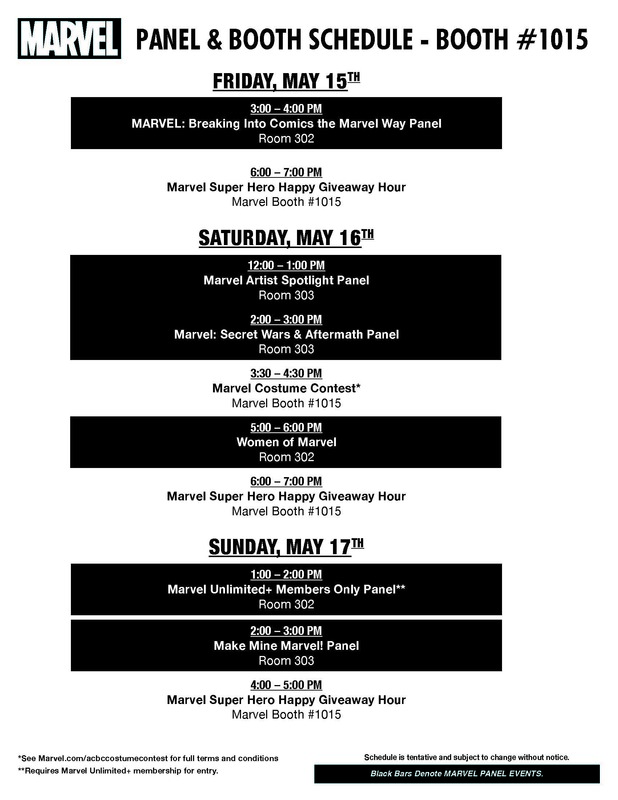 Marvel Unlimited Plus Members ONLY – show your Member Card or confirmation email at the Marvel Booth for a ticket to the event. There’s no better place to learn about our thrilling and creatively diverse series than this panel! Don’t miss some exciting discussion of our Star Wars titles as well as the lowdown on some of Marvel’s biggest and best new series! Panelists include Content Development Director Sana Amanat, Editor Katie Kubert, writer Charles Soule (Star Wars: Lando), and other Mighty Marvel Guests! Can’t make it to the convention? Follow along on Marvel.com and @Marvel on Twitter, the best way to get real-time announcements from the convention floor and up-to-the-minute panel, in-booth, and signing schedules of all your favorite Marvel creators!